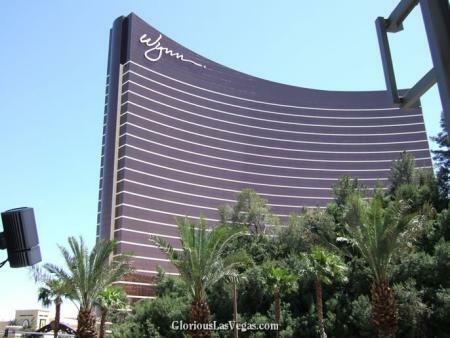 The Wynn Hotel in Las Vegas is a luxurious upmarket hotel directly opposite the Fashion Show shopping mall. Built by legendary Vegas resort owner Steve Wynn, The Wynn is a $2.7 billion hotel and casino with 2,716 hotel rooms, 111,000 square foot casino, 22 restaurants and food outlets, and the only golf course in Las Vegas. The Wynn is currently one of the more impressive hotels on the strip, and certainly outshines its current neighbours. Clad entirely in bronzed glass, the Wynn eschews the themes of other Vegas mega-resorts further south, and focuses instead on pure upmarket luxury. One of the great things about The Wynn is the beautiful landscaping and waterfalls (not to mention the huge glass structure itself!). Not only is this beautiful in its own right, it makes taking great pictures of Treasure Island and the Fashion Show extremely easy! See for yourself, with the new Wynn photo gallery that’s now online.